Two, they came in pairs, high school students from the United States and in Italy to have their portraits made by Andrea Modica. When she began this project they were individual portraits, each student bringing along a best friend or trusted companion. She quickly took the opportunity that presented itself and documented the interaction between the young adults in front of her camera in her current body of work, “Best Friends”. In the creation of these portraits she engages with these young adults in a process that requires patience, using an 8″ x 10″ camera. This slower process is one that gives her the time she needs to connect, observe and photograph just one slice in the complex transition from adolescence to adulthood. What Modica is brilliant in revealing in all of her images are the everyday gestures, the common ground that we all come from, elevating it with light for us all to see. 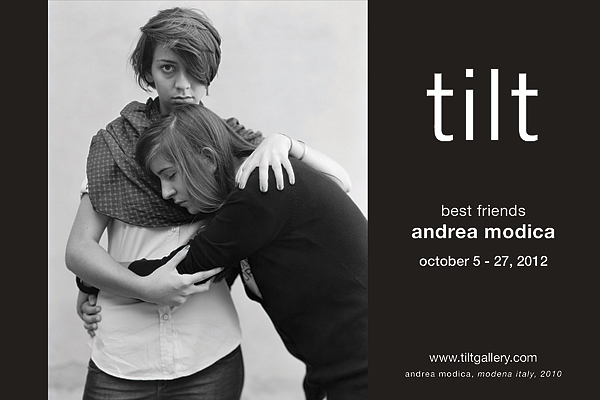 After decades of collaboration between herself and the people she is drawn to photograph, this newest body of work that Andrea Modica calls “Best Friends” reveals to us her deep understanding of what it is to be human. Andrea Modica’s images have been exhibited nationally and internationally, and are part of numerous permanent collections, such as The Museum of Modern Art and the George Eastman House to name a few. Her accomplishments have been recognized with numerous grants, commissions, and prestigious awards including a Guggenheim Fellowship in 1994. She earned her BFA in Visual Arts and Art History from State University of New York College and her MFA in Photography from Yale University School of Art. Modica currently lives in Philadelphia, PA where she is a professor in the Photography Program at Drexel University.